These pages have moved to http://www.nwsprints.co.uk where there are no annoying adverts, pop-ups or spyware and it responds quicker too! 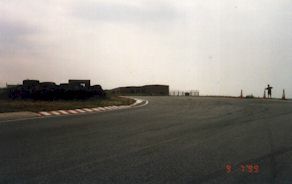 The Anglesey Racing Circuit, formerly Ty Croes, is an absolute must for sprinters in the North West. It is fast, safe and technically very demanding with three difficult complexes of bends. You also get two laps. If you have a choice of gearing, then choose your highest ratios, e.g. those used at Aintree. See also the official website and Lancs & Cheshire CC who have a site specifcally for Ty Croes. Finally, have a look at fluke motorsport for another description and more videos. I've only been to Ty Croes three times and managed to come off more times than I care to think about without recording a quick time. So be warned, the following is only something to think about if you have never seen the place before. You must walk the course first and make up your own mind as there are no convoy runs. You start up the pit lane. 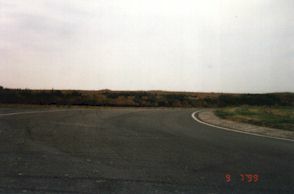 As it is downhill you ought to be almost flat in third by the time you reach school corner, the first part of which is a 45% right-hander. From earlier visits I had thought you only need to lift rather than brake on the first lap, but last time out I lost it a couple of times on turn in, so to avoid embarrassment work up to this one gradually in practice and try a good shove on the brakes so start with. Stay wide to get a good line into the second part of the bend. Either way you certainly want to carry a lot of speed into it as the road goes quite steeply uphill on the exit. The car feels light and skittish on the second apex as there is a slight brow there. If you've done it right you have drifted to the middle of the left-hand "kerb" (just a muddy patch now) ready to turn into Abbotts except that you should now be going too fast to get round Abbotts, so braking is required. 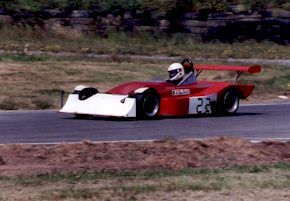 With a 1600 engine and 4.55 diff I could keep in third but with a "cammier" 1350 engine and 4.2 diff I now I change down to second. If you want some insight into going too fast round Abbots have a look at Steven Miles video! Abbotts has a blind brow and really does leap out at you. If you do overdo it, the rough stuff on the outfield will slow you down quite effectively but the advice is to let go of the steering wheel to avoid broken fingers and/or wrists. You do want to keep the momentum going as you will still be going uphill ready for the Radar complex. Radar is really unnerving. This is a 90% lefthander over a brow. It's totally blind when you are sat low down. 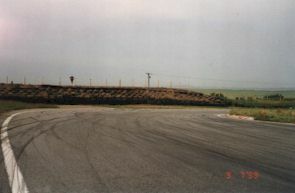 You need to turn in before you can see the bend so that you can exit on the left hand side of the track ready for the following right-hander. It's quite fast - definitely 3rd gear. Since this right-hander leads onto the top straight the exit speed is probably more important than anything else about that complex. I change down to second to avoid it bogging down on the exit. The exit kerb makes it feel almost like an "ess". 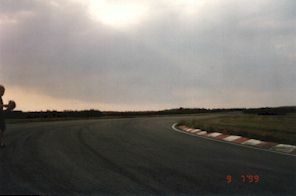 The top straight curves here and there, making it more interesting than Aintree, and it is flat in 4th. Unfortunately it leads into a hairpin with a deceptively tight exit. I seem to need to slow to walking pace (1st) to get round this. I've spun here (harmlessly) a couple of times. 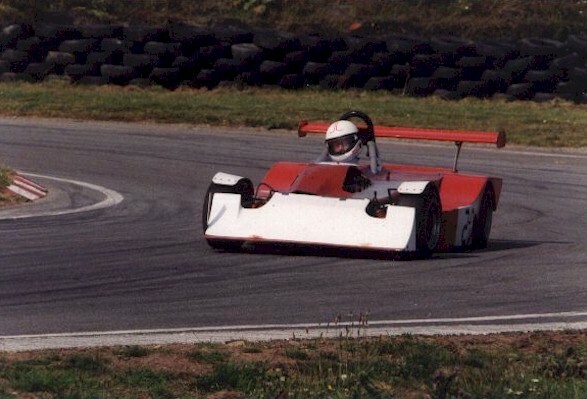 In the picture on the right I've obviously missed the apex by about a car's width and am just about to bog down in second on the exit which I think drops away a bit. You can get up into third for Douglas, which is a left hand kink, but you want to keep over to the left on the exit to get a good run at Mountview. Mountview is a right/left "ess". If you kept on the left after Douglas, I think you now want a late apex for the first (right-hand) part of the ess. The second (left-hand) part of the ess presents no problems and you should be able to get into fourth pretty soon. Obviously a good exit speed pays dividends all the way down that straight, which is downhill. The only differences for the second lap are pretty obvious. First, you need some hard braking and a downchange into the first bend. I try to use distance to the end of the rumble strip past the end of the pits to judge braking distance. Second, if you are on slicks, your tyres should have warmed up by now and most bends can be taken a bit quicker than on the first lap. Finally, Douglas can be taken much faster as you reach the finish before you have to worry about Mountview - but do watch out for the timing equipment on the offside. By taking Douglas too fast you should have a terrible line into Mountview and by the end of the weekend there are a lot of marbles on the outside. Spinning after the finish is quite possible, but not really fair on the following driver who may get a red flag unless you can get out of the way in time. See also info on the BMRC site. A55 to Bangor. A5 onto island. 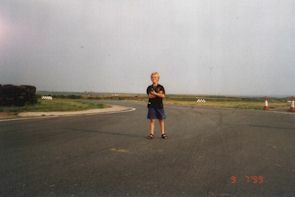 Turn left on the A4080 towards Rhosneigr. 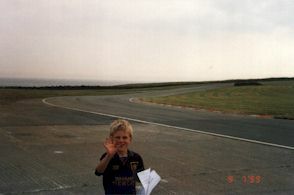 Go past Rhosneigr, then turn right at crossroads - signed "Trac". If you get to Aberffraw, then you have missed the turning. The first sequence of bends. I can take the family on holiday at the same time. No convoy run - so watch the red mist and slugs on the track during first practice! The following are intended just to give an idea of what to aim for. They are not definitive records - they are simply taken from a few fine weekends between 1999 and 2002. However, most of the times should be representative as one was a national round with the Leaders contenders being present. N.B. Some of the classes have changed over that period, e.g. single seater capacities.